this makes Imprinting a very interesting work." 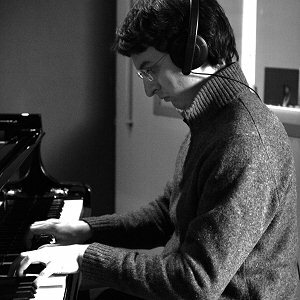 Francesco Chebat, born in Trento (Italy) in 1978, is a very interesting and talented pianist and composer. His career started at an early age, when he played in clubs in Milan. He played with many important musicians, such as Dave Weckl, Tino Tracanna, Attilio Zanchi, Gianluigi Trovesi, Sergio Orlandi, Giovanni Falzone, Riccardo Fioravanti, Maxx Furian, Emilio Soana, Paolo Tomelleri, JW Orchestra (directed by Marco Gotti), and many others. composer: all the tracks of the CD are written by Chebat, who choose the traditional acoustic trio as the best way to perform his music (more info). He works with vocalist Martha J. as pianist and arranger (more info www.marthaj.it). They released already three albums: "That's it!" piano) and "Dance your way to heaven" (original tunes, with Robrto Piccolo on double bass, Stefano Bertoli on drums and Cisco Portone on percussions). With Gianni Satta (trumpet), Francesco founded a band inspired by the famous Miles Davis's album "Tutu" and in January 2010 they release their first CD: "Promenade", a mix of acoustic and electric jazz that represents an exhibition of the ways they have been playing together during these years. All the sogns of this album are composed and arranged by Francesco Chebat. He works with JW Orchestra directed by arranger/composer/saxophonist Marco Gotti, also playing in a new CD that will be soon released. He plays with saxophonist Beppe Aliprandi in "Blue Totem", a musical project that mixes ethnic music coming from Africa and Middle-East with jazz. He plays with actor Valerio Bongiorno: most of all in "Numbert, il passeggero del secolo" (Numbert, the century's passenger), performed with success in many theatres of north of Italy. In this show Francesco makes counterpoint of the monologue melting written music, improvisation and special effects. He is actually a "second actor". He has also payed in the Vanni Stefanini trio, latin-american rythms specialist. This trio, with Attilio Zanchi on double bass, performed at Blue Note Milano and in 2004 released Nobody knows. Martha J., Giovanni Falzone, Gianluigi Trovesi, Attilio Zanchi, Marco Castiglioni, Tino Tracanna, Stefano Bertoli, Dave Weckl, Sergio Orlandi, Paolo Manzolini, Marco Gotti, Roberto Piccolo, Gianni Satta, Kyle Gregory, Maxx Furian, Toni Arco, Marco Ricci, Marco Gamba, Guido Bombardieri, Paolo Tomelleri, Emilio Soana, Dudu Kwateh, Beppe Aliprandi, Marcos Vinicius, Carlo Bagnoli, Marcello Noia, Walter Ganda, Francesco D'Auria, Riccardo Fioravanti, Vittorio Marinoni, Ney Portilho, Riccardo Vigorè, Ettore Fioravanti, Carol Sudhalter, Michael Supnick, Vanni Stefanini, Angelo Peli and many others.